Types of trampolines come in many shapes and sizes letting you choose from inside mini models to backyard styles. With such a variety to choose from there is bound to be one that can accommodate your needs. The round models usually range in size between 8 – 15 feet. The 8’ model is well received because of its convenient size. It is large enough giving you lots of jumping room, yet it takes up less backyard space and can be quite affordable. Similar versions to the round style include the 8 sided (octagon) or 12 sided types. Main difference between the round, 12 sided or 8 sided models? The most important difference would be that the round styles are softer in the center and are designed to keep the jumper in the middle of the apparatus. You see round trampolines have no angles which mean every spring points directly to the center of the jumping area creating a softer center. As you move away from the center the bounce you make will become harder. If you lose your balance it may be easier to fall forward, especially if there is more than one person jumping at the same time. For this reason 12 or 8 sided models are considered safer. Because of the angles the jumper gains more control as they are not as easily pulled into the center. Usually range anywhere from 4’ 6” X 6’ to 10’ by 17’. These measurements are taken starting from the outside of the frame. These types of trampolines offer a larger jumping area and a higher bounce, well suited for people who enjoy gymnastics. Rectangular models are also more convenient as they take up less space in the yard than the round models. Sizes usually range from 8’square up to 15’square. The square and rectangular models are very similar but the square does not offer quite as high a bounce as the rectangular ones. The name pretty much says it all. This type of trampoline is one that is placed into the ground making it level with the ground/grass around it. It is true that falling off a trampoline is the number one cause of injury when using them. Because these units are level with the ground the distance of a fall (should one happen) is greatly minimized reducing the risk of more serious types of injuries. There are many types of trampolines that come with all the necessary safety features. If you prefer the above ground type you may consider purchasing an enclosed model to avoid falling off injuries. Mini trampolines are built for single person use and are a great choice when you are limited for space. You can even store some models in a closet which makes them a great space saver when you’re not using them. Some mini trampolines are portable making them handy for frequent travelers. Re-bounders usually range in size from 32 inches to 50 inches, with the most common size being 40”. 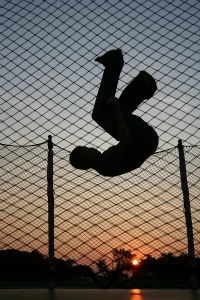 It is hard not to be drawn into the fun and the benefits that trampolining offers. Ready to jump in? 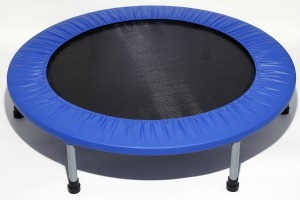 If so check out our section on buying a trampoline which goes into more detail.